Perhaps no other building in Syracuse, and certainly no other Syracuse house, has had such an impact on architecture, art and design in the 110 years since it was built as the Gustav Stickley house. The Stickley House – or at least its interior – helped jump start the Craftsman Movement, and once-dominant and still popular component of the American Arts and Crafts Movement. The interior was first nationally noticed in vol. 3, no. 3 of the Stickley’s sponsored Craftsman Magazine, when Samuel Howe published a well illustrated article “A Visit to the House of Mr. Stickley.” (the entire article can be read attached to the 1984 National Register nomination). These illustrations of Stickley’s new interior helped launch the Arts and Crafts movement in American architecture and interior design, and will also help in the forthcoming restoration. The house was listed on the National Register of Historic Places in 1984 and is a local protected site. After many years of neglect, it was announced in 2012 that it would be restored as an Arts & Crafts gallery – part of the Everson Museum. This plan fell through, however, due to financial problems at the Everson. 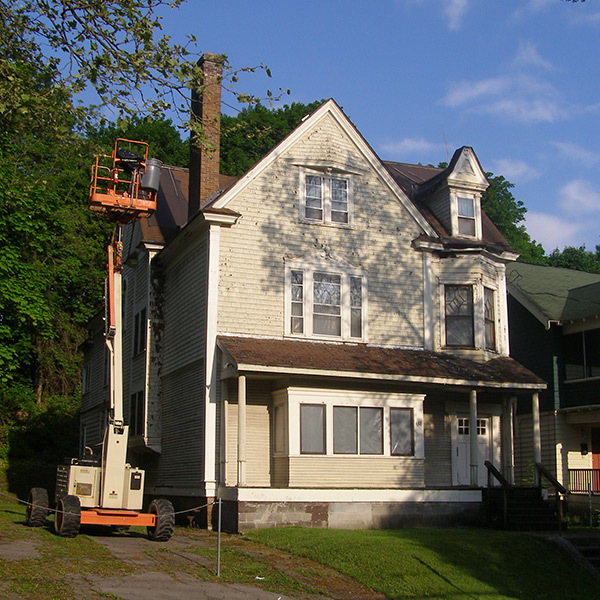 As of Summer 2015 it appears that restoration will be undertaken by the University Neighborhood Preservation Association (UNPA) with state funds and that at a later date the Onondaga Historical Association will take possession. From an article about Stickley’s purchase of the original house we learn that he bought it from the Rosenbloom estate and that Daniel Rosenbloom had overseen the construction. Wellington T. Taber was the architect and detailed information about the original plan and decoration is provided – allowing us to compare the original house what Stickley redesigned – after a fire. That fire took place Christmas eve 1901 (not 1902 as is reported in the National Register nomination written in 1984). Gustav Stickley of the firm of Stickley & Simonds has purchased from the estate of S. Rosenbloom the new house which is under construction at No. 416 Columbus Ave. The consideration is not made public. The house upon completion will be taken possession of by Mr. Stickley for a family residence. The building occupies a terraced lot of the regulation size and Mr. Stickley has an option on the lots on each side of the house, both owned the Rosenbloom estate. The house was designed by architect Wellington T. Taber and constructed under the personal direction of Daniel Rosenbloom. It has all modern equipments, including two bath rooms and a conservatory, the rooms all being large. The structure is three stories high in addition to attic. The work of interior decoration has been commenced and the entire scheme is artistic. The spacious lower floor hall and parlor is treated in a gray brown oak and the side walls are covered with a Moravian coated material with an indefinite brocade stripe. The dining room will be cased in gum wood with Venetian walls. The general color effect in several of the room will be gobelin blue and old orange. The parlor will be of a deep green hue with Pompeian decorations and the bedrooms will be done in delicate colors. There will be considerable work in the way of artistic ceiling decoration. It will take several weeks to complete the decorations. Wright is reported to have set up his architectural office in Syracuse in 1892, and taught at the new Syracuse University Architectural Department beginning in 1891-92. By 1901 he was presumably established as a leading young (35) architect in Syracuse, though few of his buildings from this period are known. It is intriguing to think that Wright may have had a role in Stickley’s design, and what effect Stickley’s ideas had on Wright (who himself became a prolific architect of fine Syracuse homes). Besides the architecture and design of the house, there is a close association of the house with Gustav Stickley himself and the Stickley family. The family lived here until 1905 when they moved to New York, but they kept an option on the house and it was re-purchased in 1913 by Stickley’s daughter and son-in-law. 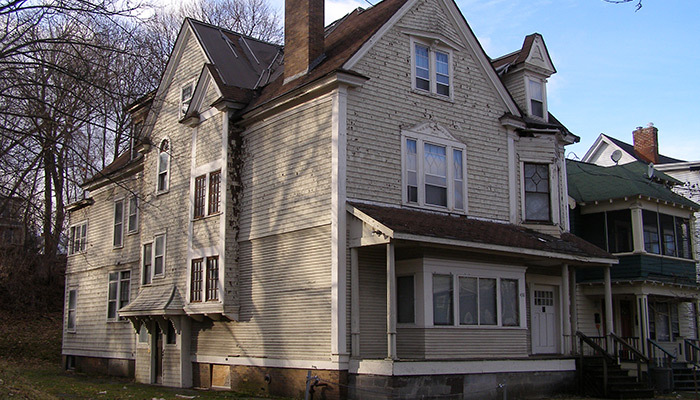 After bankruptcy closed Carftsman activities in 1915, Stickley moved back to the house and lived here until his death in 1942 in a third floor apartment created for him. Stubblebine, Ray, Stickley’s Craftsman Homes: plans, Drawings, Photographs (Salt Lake City: Gibbs Smith, Publisher, 2006).